Modern British & Irish Art – London 9th April 2019. 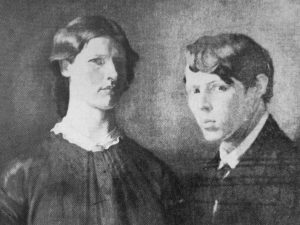 The Self portrait and the Grace portrait are very likely to be studies for a double portrait of the couple Orpen did in 1901, the year of his wedding. Bruce Arnold makes reference to the oil and a study in his book – ‘Mirror to an Age’. Photo of ‘William and Grace’ – double portrait – oil on canvas : 22 X 31 inches. 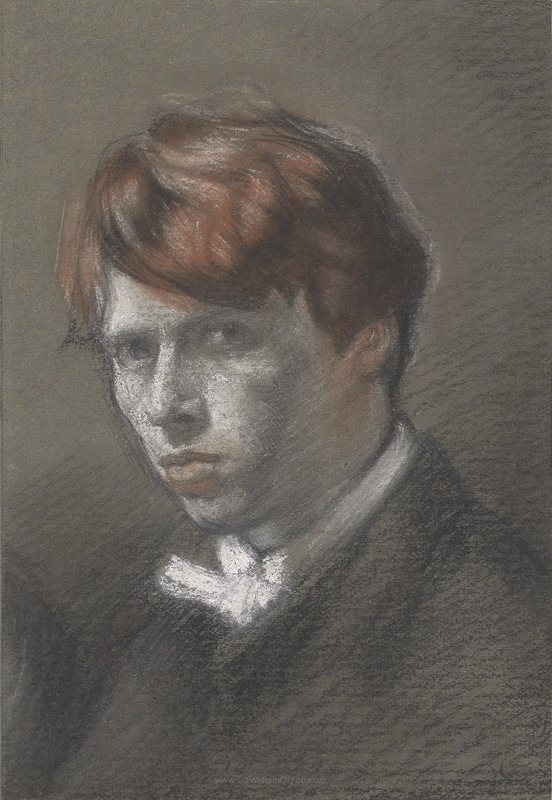 Exhibited : New Gallery, London, Society of Portrait Painters, 11th Exhibition, 1901. Current Location : Not Known. Arnold, Bruce, Orpen: Mirror to an Age, Jonathan Cape, London, 1981, page 102. It is not clear whether the “Two Portraits” No.7 Carfax Gallery refers to two separate drawings (in which case these two could be the same) or a double portrait on a single sheet (as per the oil). The three Portraits in the Christie’s sale. Sir William Orpen, R.A., R.H.A. (1878-1931). Portrait of Grace. Coloured chalk on dark grey paper. 6 1/8 X x 4 ¼ inches. (15 x 10.8 cm.). Estimate £1,500 – £2,000 ($1,970 – $2,626). Update – SOLD today 9th April for £3500. Self portrait. Ccoloured chalk on dark grey paper. 6 1/8 x 4 ½ inches. (15.5 x 10.9 cm.). Estimate £4,000 – £6,000 ($5,252 – $7,878). Update – SOLD today 9th April for £28,000. 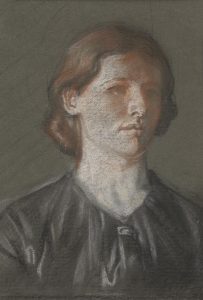 Portrait of Annie, the artist’s mother. Coloured chalk on dark grey paper. 6 1/8 X 5 ¼ inches. (15.3 x 13.3 cm.). Estimate £1,000 – £1,500 ($1,313 – $1,970). Update – SOLD today 9th April for £3800. 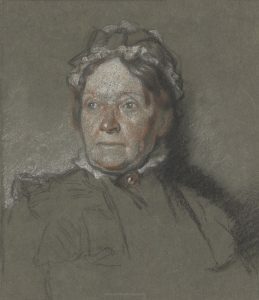 It is also probable that the painting of Orpen’s Mother, Annie, dating to about the same time, 1901. 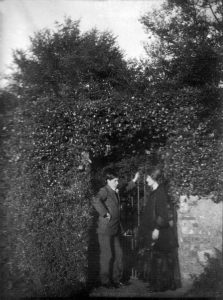 Photograph of William and Grace Orpen at the gate of ‘Oriel’ Stillorgan, County Dublin, again from around the same period – 1901, which may also have inspired the double portrait. The 9th April Auction Results will be added to this post as soon as they are published. I do hope these beautiful portraits of Orpen’s wife Grace (Nee Knewstub), his mother Annie (Nee Caulfeild) and a self portrait stay together as a set.